Language as a radical process of creating meanings as against a set of codes arranged to hold a mirror to so-called reality is central to most feminist discourses. Feminist practices around language have sought to trace how and why ideologies have been time and again constructed in language in terms of gender identification through sexual difference. The seemingly perpetual enactment of identities through ideologies, constantly understood by feminist linguists as naming, an attempt to re-establish rules already in place, is a continuous process of fixing meanings through re/presentation. Ideologies worldwide, including sexist discourses, are legitimized by re/presentation. What in other words is simply understood as ‘common knowledge’ is a set of ideologies made legitimate by covert processes where meanings become naturalized and normalized. Translation by virtue of its innate quality of be/coming, not be/ing is language in process, language that constantly eludes meaning and shifts from fixed understanding to discursive methods of making new meanings. Imbued with such multiplicity, translation, in lesbian feminist contexts, such as those of Brossard, lends itself to the dynamics of recreation of meanings, thereby re/presenting to break the imperatives of re/presentation. Beginning with the idea that there can be no ‘actual’ experience in writing, and that writing is only a translation of experience, all writing amounts to translation. One set of linguistic tools (available to the author at the time of translating the ‘actual’, in effect, recalled experience) constitutes writing at a given point of time. Given the fact that so many or only as many linguistic tools were available to the ‘author’ at a given point of time, writing is never ‘original’ or ‘complete’. Feminist translation in the Brossardian oeuvre is a reciprocal project whereby the ‘feminist intertext’ (Harwood 62) deconstructs the linear hierarchical relationship between author and translator and makes way for a collaborative practice of ecriture au feminine (writing in the feminine). In a networking of negotiations with language, Nicole Brossard and translators of her works (chiefly from French to English) constitute a feminist collective which reiterates and re/in/scribes feminist identities in subversive acts that appropriate the classical patriarchal device of constant invocation to fix meanings. Nicole Brossard is one of the most prominent avant-garde writers of Canada who emerged as a writer from the volatile nationalist movement of modernity in the aftermath of Quebec’s Quiet Revolution in the 1960s. In the throes of new-found motherhood, Brossard came out as lesbian which meant to her, writing not just her body, but a body in relation to women’s bodies. Brossard believes that the act of em/bodying oneself in language as a lesbian is also an act of bodying forth. Hence her writing on the one hand articulates the desire for women and her translations on the other take the desiring body forth into a collective attempt at reiterating woman. Feminist translations of Nicole Brossard not only derive from her writing, but feed into it. Translation becomes an act of departure from the ‘original’ to arrive at shared feminist negotiations with meaning. Nicole Brossard is not only one of the most widely translated lesbian writers; her translations into English have opened up dynamic spaces for feminist translation theory. Translation is a conscious feminist act in Brossard, a creation of women’s space in writing that makes living in a woman’s skin, speaking from a woman’s tongue, an experience accessible to varied linguistic and cultural understandings. One of Brossard’s collection of poems titled French Kiss connotes the fluidity of Brossard’s texts in terms of the free libidinal space of writing and the melting of meanings. The process of translation becomes the act of touching a woman’s body, a sliding of meaning, a tasting of the grain of one’s experience as woman on another woman’s tongue. The process of writing in turn becomes the act of translating oneself as a woman and the act of translating, a process of writing oneself. To this effect, writing and translation are inextricably rendered into one process. Feminist translation in Brossard, by virtue of being a feminist act is not just women translating women, but the act of women writing women. 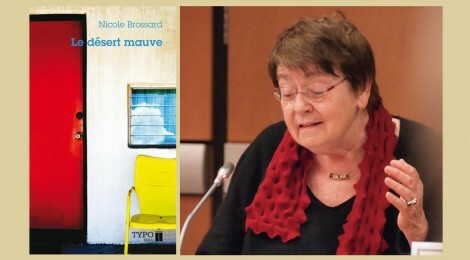 In Le Desert Mauve, Nicole Brossard pushes the frontiers of the translat/ability of experimental feminist writing by self-translating the first part of the book, symbolically and interestingly into the same language in the third part and subverts conventional notions of translation, displacing linear understandings of identity and experience. Furthermore, the two parts are interspersed by a series of pictures, a visual re/presentation of the character Longman who features in both versions of print on either side. Meanings literally get displaced on either side of patriarchy in this work which translates itself. Brossard captures the fluid nuances of the lesbian body in the arbitrariness of language that constantly deludes itself and has to be made sense of by a constant revoking of meanings through translation. Le Mauve Desert, later translated into Mauve Desert further renewed the cyclical process of writing as translation in a certain seamless rendering of translation into what Susanne de Lotbiniere-Harwood, the translator, terms as a “re-writing in the feminine” (Harwood 62). Mauve Desert in essence becomes a feminist work that evokes the power of translation to re/create meanings for women in four different texts which, to borrow an ideology from Erin Moure, “transelate” (Sheep’s Vigil by a Fervent Person: A Translation by Eirin Mouré) one another in the new found(ed) joy of lesbian identities. Brossard’s Baroque de L’aube, translated with the title Baroque at Dawn finds Brossard donning her own character in the novel, bodying herself forth within the pages, uttering the guttural idea of the text as a process of voicing, writing and translating oneself in one’s own terms.